on the Teign had increased from 400 boatloads of clay per year before the canal was built, to 600 per year. This figure increased to 1,000 per year by 1854. From 1820 the canal was also used in conjunction with George Templer’s Granite tramway to transport granite from the family’s quarry complex on Haytor Down, to Ventiford. However, the granite trade was somewhat sporadic with fluctuating production. No granite was produced or transported between 1841 and 1851. By 1858 the quarries and tramway had closed. In 1829 the entire Stover estate, including the canal and the tramway, was sold to Edward Seymour, the Duke of Somerset. 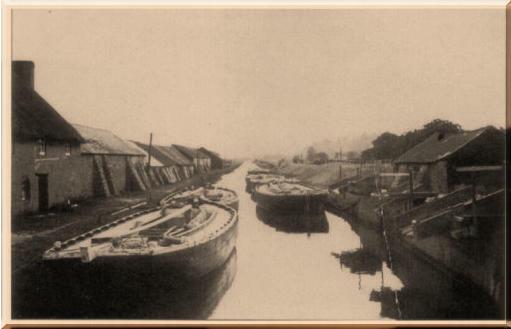 The Duke is reputed to have taken little interest in the canal which by 1840 had been leased to Whiteway and Mortimer, one of the clay companies operating in the area. In the late 1850s, the proposal to construct the Moretonhampstead and South Devon Railway (MSDR) included utilising the course of both the granite tramway and the canal. By 1862 the railway company had purchased both and the new railway was built over the course of the tramway from Brimley to Ventiford then to run alongside the canal, down to Newton Abbot. The railway was completed in 1866 and although the MSDR had no obligation to maintain the canal, from 1867 it was leased to Messrs Watts, Blake, Bearne and Co. (WBB) who continued to use it to transport clay from Teignbridge clay cellars. The canal above Teignbridge was no longer used other than to give barges access to Graving Dock Lock. This lock had become the main barge maintenance and repair workshop; the original dry dock having been destroyed at Teigngrace when the railway was built over it. The canal above Graving Dock became derelict from this point onward. In 1877 the railway and the canal were purchased by the Great Western Railway Co. (GWR) and by 1896 they had commissioned a survey into the future of the canal. At that time, Stover was the only canal owned by GWR, where income exceeded expenditure so its future was temporarily assured. However, most of the expense was now falling on WBB, the lessees of the canal and although new lock gates were fitted in 1906, the decline of the canal was now inevitable with competition from railways and motor transport. Although the canal remained in use for another 30 years, by 1937 no clay companies were using barges to transport their clay, and when WBB’s lease expired i n 1942 , it was not renewed. The GWR then opted to close the canal to barge traffic and discontinue maintenance. Water remained in the canal until 1951 when it burst its banks, flooding part of a nearby clay works. Since then the channel and all the locks have fallen into a state of serious neglect. The canal is currently owned by Network Rail, although Jetty Marsh Lock and Ventiford Basin are owned by Teignbridge District Council (TDC). The section of canal towpath between Teigngrace Lock and the canal bridge forms part of the Templer Way historic trail. The Stover Trail cycle and walkway was constructed by Devon County Council and opened in 2015.